“Lights, please. "And there were in the same country shepherds abiding in the field…” Linus Van Pelt’s childlike voice filled my car. And I loved it. 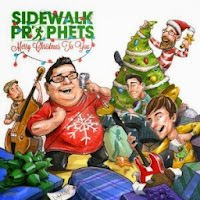 Sometime in early November, I listened to a radio interview on K-Love with David Frey, the lead singer of Sidewalk Prophets. He talked about making their new album, Merry Christmas to You. They had wrapped up the music and thought they had everything ready to go when the producers realized they needed to ask the voice of Linus for permission to use the monologue. Unfortunately he had passed away. But, at the last minute they reached his wife and added Linus’s voice to their wonderful new Christmas album. The music exudes joy as it celebrates the season with fun and reverence. I’ve enjoyed the four new songs the group composed as well as their renditions of familiar songs and carols. This is a great CD for family time in the car or to decorate the tree by. I liked it so much that I bought it for my daughters, and they all gave it a thumbs up. Do you have a favorite Christmas Album or CD? Please share.